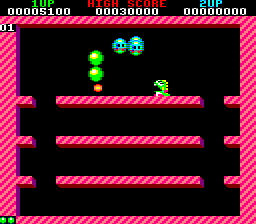 BB4CPC (shorthand for "Bubble Bobble for CPC") is a retro remake of "Bubble Bobble", Taito's unforgettable 1986 arcade game hit, for the Amstrad CPC 8-bit home computer series. It was developed with the purpose of running on any CPC machine, regardless of RAM size or CRTC model, while staying as faithful to the original game as it could be done in 48 kB of code and data. BB4CPC was developed by me, "CNGSOFT". BB4CPC is freeware; it is provided "as is" with no warranty. Being a fan work, the copyright of the original arcade game belongs to Taito; I just hold rights over this remake. The player assumes the role of a cute baby dragon whose single weapon is his bubble breath: he can defeat his enemies by blowing bubbles at them, then popping these before they break free of their soap prison and strike back. The game is made of 100 stages plagued by monsters whose contact is lethal to the player; by defeating all monsters in a stage, the player can move on to the next stage. But beware, time is limited: at the first warning, monsters will turn red, faster and more aggressive; the second warning will spawn an invulnerable monster who hunts the player! Fortunately, the game provides items that boost the player's score and supply him with power-ups, and two players can play at once and cooperate in their quest through the cave of monsters. And the bubbles themselves can be very useful for reaching far or high locations too! The default controls are both joysticks (FIRE1: shoot bubbles, FIRE2: jump) but players can redefine them if needed. The key P pauses and unpauses the game, and ESCAPE aborts it and returns to the title screen. BUB The game's main hero! He's under the first player's control. BOB Bub's brother and partner in adventures! The second player controls him. Zen-Chan The first species of monster that Bub and Bob will meet. Landborne and unarmed, it will run and jump behind them. Mighta The second type of monster in the game. Landborne yet armed with boulders, it chases players and shoots at them. Monsta The third species, it can fly but it doesn't actively hunt the players; it merely bounces against the scenery. Pulpul The fourth species, it's airborne too, and it won't chase the players either, but it will try sneaking into gaps. Banebou The fifth species, it bounces on its springy coil, but that doesn't keep him from attacking the players. Hidegons The sixth type, it's landborne and doesn't jump too well, but it can spew fireballs at the dragons! Drunk The seventh type, it's landborne, jumps with ease and is armed with bottles that bounce against the walls! Space Invader The eighth type, it's landborne and can't jump at all, but it will chase the players while shooting beams! Skel Monsta When a stage runs out of time, Skel Monstas will spawn on each player's opposite corner and hunt them!
? ? ? Something hides in the 100th stage. Something really big, extremely evil and... clad in green. What can it be? EXTEND bubbles They appear at random (or not...) and upon completing the word the player will be awarded an extra life. Water bubble These water-filled bubbles, when popped, will unleash a stream that will wash any monsters out... and dragons, too! Spark bubble The lightning inside the bubble will shoot horizontally when released, zapping any baddies and players it will run into! Fire bubble The bubbled flame will fall down and spawn a wildfire on platforms. Monsters will be burnt, and so will players! Sneaker This power-up item will make the player run and jump faster. Blue candy This item lets the player shoot faster-flying bubbles. Pink candy This candy extends the player's bubble shooting range. Yellow candy This candy improves the player's bubble shooting rate. Umbrella Thanks to this item players will speed their quest up by skipping 3, 5 or 7 levels. Chack'n heart This power-up will render enemies harmless and vulnerable to the players' touch! Candy cane This item will drop a giant fruit at the end of a level and turn all existing bubbles into fruits. Treasure chest Ditto about the candy cane, but with diamonds! Book The magic spells in the book will turn all active enemies into 9000p diamonds. Bomb Ditto about the book, but with 10000p diamonds! Potion Bonus mode! The screen will fill with score items, and players will have to try to get 'em all before time's over!
? ? ? There are many more items, but it's up to the players to find out what they're for! Popping more than one bubbled enemy at once awards higher scores and better items. Bubbles can be pushed by walking towards them, but they'll pop if pushed too hard. Many seemingly random events in the game actually follow a logic. Stay attentive. Prioritize scoring over fast gameplay at the beginning; you'll need those extra lives. The author would like to pay homage to the memory of Fukio "MTJ" Mitsuji (1960-2008), the creator of the original "Bubble Bobble". BB4CPC was mostly the work of a single person; external input was sadly limited to several musical scores by Tom & Jerry and some few weeks of beta-testing. So, if you liked the game but you found certain details in need of improvement, just write me a message and we'll see what can be done. Do you believe that you can draw a better title screen for the game, for instance? Sure, draw one! Are you able to write better music and sound effects? Go ahead, the more the merrier! BB4CPC can become the best retro remake ever thanks to your cooperation. 27/12/2011: second public release. Water streams fall down if created inside walls, keeping the game from halting; Skel Monsta always spawns when time runs out. 03/03/2012: third public release. Many bugfixes and patches (water streams cancelling themselves, baddies jumping too much or chasing dead players, umbrella warping to wrong rounds, bonus items removed or corrupted after levels, big baddie unable to shoot or escape, baddies now start moving in waves) plus a new unlockable "Ultra Mode". 09/09/2012: fourth public release. New loading screen, more compatible tape encoding, dynamicly-adjusted difficulty, "Hurry up!!" shows when the alarm rings, fixed bubble popping timings and boundaries (cfr. rounds 10, 13, 19...), enemy shots can't kill players using the Chack'n Heart, the ring power-up is more generous, etc. 15/09/2012: fifth public release. Minor fixes in the title screen and the "Hurry up!!" logic. 25/01/2013: sixth public release. Fixed a regression in the "Continue" logic, improved EXTEND and fruit drops logic, bubbles now clump together in less predictable patterns, changed the behavior of the clock powerup (baddies freeze instead of slowing down), minor graphical fixes. 04/02/2013: seventh public release. Fixed a regression in the recursive bubble popping routine (it caused a bug in round 100) and a bug in the Pulpul motion, and gave the players more time to move at the start of a round. The Exomizer unpacking routine is 15% faster now. 27/03/2013: eighth public release. Pixel cleanup in title screen and in-game sprites, fixed a colour bug in ULTRA MODE, "HURRY UP" paints all enemies red, faster lightning sparks, fixed a glitch in misaligned sprites, faster Super Drunk round, faster tile rendering. 07/07/2013: ninth public release. New overscan intro screen, new in-game tutorial (128k only), fixed water streams (ten blocks rather than just eight) and drowned enemies (water carries them now), minor changes in title screen and sprites, minor scoring overflow bugfixes, minor size and speed optimisations. 27/07/2013: very tiny CRTC compatibility patch. Game texts still read "07/07/2013" but new files are timestamped July 27th 2013. 30/12/2013: tenth public release. Wildfire now looks like in the original arcade; flame and water bubbles drop their contents from their top rather than bottom (rounds 12 and 70 play now more closely to the arcade); several sprites have been partially redrawn (bubble dragons, Mighta, hamburger, peach, doughnut, Super Drunk); secret codes have their own tile; size optimisations in the Exomizer unpacking routine; the "Extend" bubbles cycle when completing them (like in the arcade); HALT no longer used for sync; minor size and speed optimisations. 26/04/2014: RetroMadrid 2014 special release: 2000 baud tape recording with custom turbo loader, umbrellas and silver doors no longer forget rounds that would normally turn bubbles into fruit, minor size optimisations. 20/06/2014: twelfth public release. Better graphics for the Super and Ultra endings, enemies don't chase dying players.